Based on experience within our walls and in discussion with technicians across the country, we can fairly call Gen 1 Prius battery failures “common” and even “predictable.” The youngest we’ve seen served 130,000 miles, some make it past 200,000 miles. Overall we’ve found 150,000 miles a reasonable expectation of how long the packs will last. Note: This is not the same as the Gen 1 Prius HV Battery electrolyte discharge problem, which Toyota addressed with “service campaign” (a.k.a. recall) SSC 40G to reseal the positive battery terminals. The cells are designed to be charged and discharged on a regular basis. As they age, they are increasingly sensitive to extended periods of rest and will slowly discharge internally. The situation worsens until the cells are totally compromised; they will not maintain a consistent potential even during use, when the Prius charges and discharges them in normal driving. 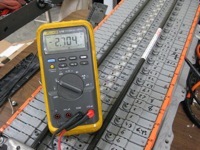 The result is wild swings of voltage within individual modules (seen on the scan tool in pairs, or “blocks”), which makes it very difficult for the onboard computer to regulate total pack state-of-charge. 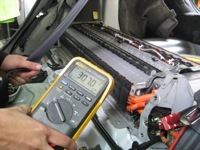 When the “delta state-of-charge” (or fluctuation of state-of-charge) gets too big, the battery computer (called the “electronic control unit” or ECU) will set a code P3006: “Battery SOC are uneven” or “Battery Levels Uneven”. 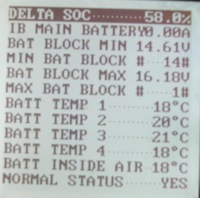 (Pic of scan tool reading delta SOC of 58%) The main hybrid computer (or HV ECU, which is den mother of the car) will set a corresponding code P3000: “HV Battery Malfunction” which simply points to the Battery ECU for more information. To the driver, the only feedback is the master warning (red triangle) and “check engine” lights. Drivers may also notice reduced fuel economy (though there are many things that can cause that) and the battery charge display dithering around more than usual. Sometimes the engine will turn on and off over and over. If the warnings are ignored and the battery gets even worse, the HV ECU will determine that the battery is unreliable, abandon it, and enter a “limp mode”. Symptoms are the engine revving at high RPM, low power, and jerky performance. What the computer is actually doing is using the engine to generate electricity with MG1 (one of the motor-generators in the transmission) and then channeling that power directly to MG2 (the second motor-generator connected to the wheels) to allow the car to keep moving. 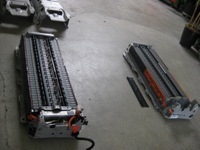 The method is not exact and can actually cause severe overcharging and/or undercharging of the battery, stress out the HV Inverter, and potentially wreak further damage. Also, since the HV battery is out of the picture, the system cannot use the DC/DC converter to charge the 12V auxiliary battery (akin to driving a conventional car with a bad alternator, where the 12V drains down), and the car will eventually shut down. Many more codes may follow if the 12V system gets low enough. Because the symptoms of battery failure are well understood, we only charge a half hour for diagnostics: to hook up the scan tool, confirm the health of the battery, and survey the health of related components to get a firm estimate of total necessary investment. Note that this diag charge is typically much less than the dealer, another reason to bring your Prius to LG first. Despite prevailing rumor, new battery packs from Toyota are not unreasonably expensive. While they are a significant financial investment, they can be expected to last as long as originals, as they are brand new and OE grade. The replacement assembly does not include control components (HV relays, ECU, harnesses) or vent tubes. Thus it takes a bit more labor to transfer these components from the original assembly. When LG first opened we could purchase used battery packs for less than a thousand dollars. Even in the last year, we’ve seen prices double from salvage yards given increasing numbers of battery failures and dwindling supply of second-hand replacements. It is hard to find a low-mileage battery for less than $2000, and the prices vary depending on availability. 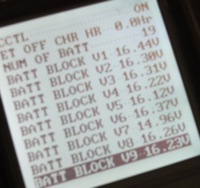 Used packs do appear on eBay on a regular basis, but it can be very hard to determine the health of such a battery. It’s quite likely the part is for sale exactly because it’s already gone bad. As with any salvaged part, it’s likely sat for an extended period and further degraded. For all these reasons, LG no longer recommends used packs. If a customer insists on supplying their own, we will install it, with no guarantee, for three hours labor ($360). We no longer recommend rebuilding battery packs. See another blog here. For inquiries on battery diagnostics or replacement, use the LG contact form.